For six months this year, Milan has expanded beyond its fashion and design personality to act as a window to the world for Expo 2015. The Expo used to be better known as the World’s Fair, but over time, the Expo has prevailed. 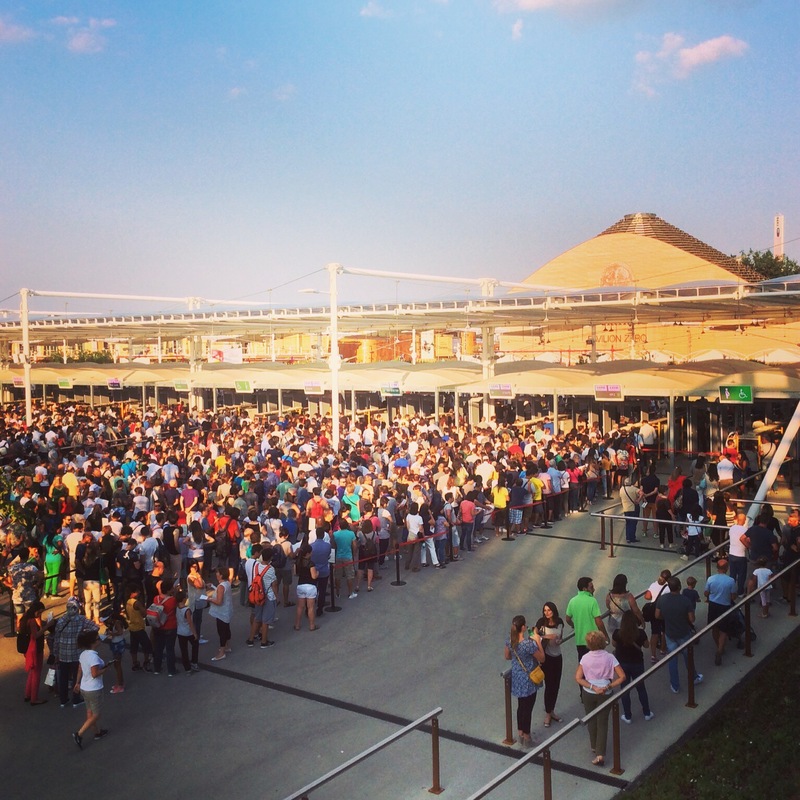 Major, or universal expositions (like the current one in Milan) take place every five years. The last one was in Shanghai in 2010 and had the theme “Better City, Better Life”. In between the Shanghai Expo and the current one, there was a smaller one held in South Korea. This intermediate event was considered a specialized exposition, one that usually lasts for three months and has a more narrowly defined theme; in this case, “The Living Ocean and Coast”. The theme for Expo 2015 surrounds food and feeding the world – “Feeding the Planet, Energy for Life”. The Expo is a mammoth event with participation from over 140 countries, each with its own pavilion showcasing foods abundant in the area, strategies for agricultural growth, and general cultural information. There are special events throughout the day, tons of activities for families and kids; and if you’d been around in June, you would have been witness to the setting of a world’s record for the longest pizza. We left the city center on the metro at about 6pm on a Saturday, along with a couple hundred of our closest friends, a few more piling into the cars with each stop. The evening Expo ticket is a bargain at 5€ (the full day pass is 39€), and is good from 7pm until closing (11pm or midnight, depending on day of the week). Although the metro station is within easy walking distance from the ticket booths and general entrance, it’s a long slog from the turnstiles to the real center of activity. There are several entrances though, so find the one that works for you, wear comfortable walking shoes, and bring an extra dose of patience if you’re someone who doesn’t readily embrace crowds! We stood looking at these statues, each honoring certain categories of food – sweets, fruits, meats, bread, wine (my kind of category! ), while also trying to make sense of the map so we could plan our time. You may want to skip this step…the map can be overwhelming. Don’t get me wrong – I love a good map, but this one only served to let us know how sprawling the event is, and that chances were low, even with the best plan, that we would see everything we hoped to during the remaining evening hours. The better plan was for us to take it as it came. Follow what looks interesting, try something you didn’t think you would, and keep the map handy should you find yourself hopelessly lost somewhere around the backside of Poland. Trust me. This can happen. line for food in Argentina was discouragingly long. It almost caused us to turn away, but thankfully we navigated around the lines of hungry folk and started walking up a circular ramp. We ended up one floor above ground, facing a stage with a screen indicating a show was starting in about five minutes. The show was 20-30 minutes of nonstop action, and we had the best view in the place. The Expo is where entertainment meets education. After our stint at Argentina, we flowed through a couple other countries and wound our way over to the chocolate section. We watched a video about the (incredibly elaborate) process required to go from cacao bean to edible chocolate. It’s quite involved and made me feel guilty (which didn’t last long!) for munching down a bar so quickly without much consideration of what it took to make it. When our stomachs started grumbling we headed for the food trucks in the America section. The lines were manageable and the food familiar. We’d been inundated with so many wonderful aromas as we moved from pavilion to pavilion. Trying something new would have been the adventurous play. In any case, Food Truck Nation was where we ended up. I had the spicy shrimp roll. Can we say, “yum”? After dinner we skated through a few more places and made it back to the Tree of Life in time for its presentation of lights. Simply lovely, and while I’ve never seen it during the day, I can’t imagine that the backdrop of the night sky isn’t the preferred way to see it.